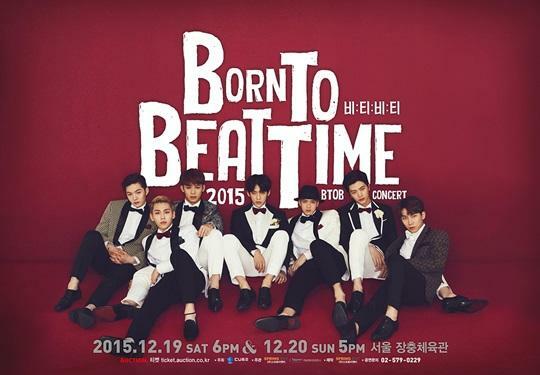 Tickets for BTOB's upcoming solo concert were completely sold out in five minutes. BTOB's new solo concert will be held in Seoul on December 29th under the title of 'BORN TO BEAT TIME' and meet up with many fans to make another special memory together. The concert tickets were first opened for official fan club members on November 27th, and the rest of the tickets were opened a few hours afterwards. All of the tickets were completely sold out in five minutes, further indicating BTOB's colossal popularity and influence. A great number of K-Pop fans have been showing huge anticipation for BTOB's upcoming concert, and their fans ahd to go through a war to book the tickets. The concert will be held at Jangchoong Gym, which accommodates eight thousand people at once. Fans who failed to purchase the tickets are now focusing their attention to cancelled tickets, and they are also strongly requesting for extra tickets. BTOB is widely recognized for their energetic performance, and they will lead their fans through another phenomenal concert experience. BTOB has made a big hit with ballad title track 'It's Okay' earlier this year, and also with a dance number titled 'Way Back Home.' BTOB will perform all of the hit numbers that they have released over the years, and also present some special unit and solo performances. Meanwhile, BTOB held a successful fan meeting in Hong Kong on November 27th, and the boy will start getting prepared for 'BORN TO BEAT TIME' concert in a few days.